A wildlife trust has criticised the decision not to designate an Isle of Wight coastal area as a Marine Conservation Zone (MCZ). Bembridge is home to kaleidoscope stalked jellyfish, and short and long snouted seahorses. 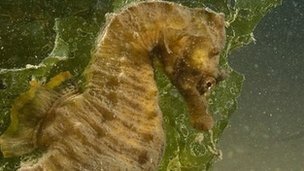 Jolyon Chesworth, head of marine conservation for Hampshire and Isle of Wight Wildlife Trust, said he was "absolutely staggered" by the decision. But Defra said costs would top £183,000 a year. Bembridge was one of 127 proposed marine conservation zonesjudged by government advisers to be at high risk. Mr Chesworth said: "Bembridge is well known, it's been well researched and there's lots of evidence going back 40 to 50 years, so we've got a good idea not just of what is here but what was here. "It's a really quite complex matrix of habitats in this area that makes Bembridge particularly special. "If they weren't managed, these habitats would be at risk." He added that fishing and the anchoring of ships, including commercial vessels heading for Southampton Port, were exacerbating the problem. Bembridge is the only known regional location of maerl, a red seaweed which provides shelter to other species. Its sand and gravel beds are a breeding ground for sea breem, and its rocky areas habitats for sponges and juvenile edible crabs. The mud contains spoon worms which have "brains in their long tongues, which extend out of the burrows in search of food". Defra said there was evidence that the area was important for a number of species, but cited a "significant unquantified cost" associated with cargo ships anchoring outside Southampton Port, suggesting this needed further assessment. Mr Chesworth said: "The sites have been designed around a compromise between environment and socio-economics." Out of the nine proposed sites off the coasts of Hampshire and the Isle of Wight, none were designated MCZs. The UK's wildlife trusts are presenting a petition of 249,859 signatures to natural environment minister Richard Benyon, calling for greater marine protection in UK waters.